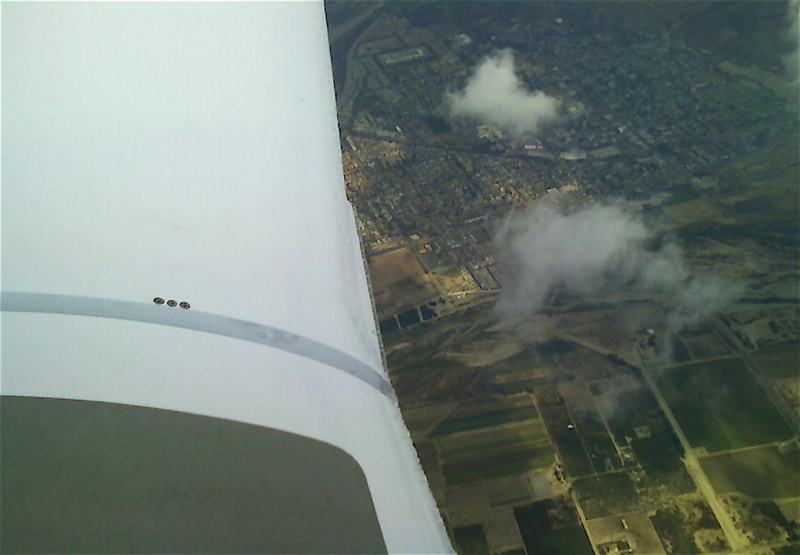 Today, on the way back from Paso Robles, air traffic control (ATC) gave me a new clearance. Instead of flying down east of the mountains (over the desert toward Bakersfield) we were given a route right over the mountains themselves, on a long diagonal toward the coast (over the Fellows VOR to the OHIGH intersection and on to the Filmore VOR) at nine thousand feet. Stable air cools at a rate of two degrees centigrade every thousand feet. That means that if it is 18c on the ground, at nine thousand feet it will be 0c. Freezing. If the airframe is cooled to freezing, and there is visible moisture in the air (fly through a cloud, fly while it is raining on your plane), then ice will accumulate on the plane. The most dangerous ice is clear ice, which is harder to see out on the wing and heavier per unit of volume. The most dangerous way to accumulate ice is in freezing rain. It was not 18c on the ground, but the air was not stable. 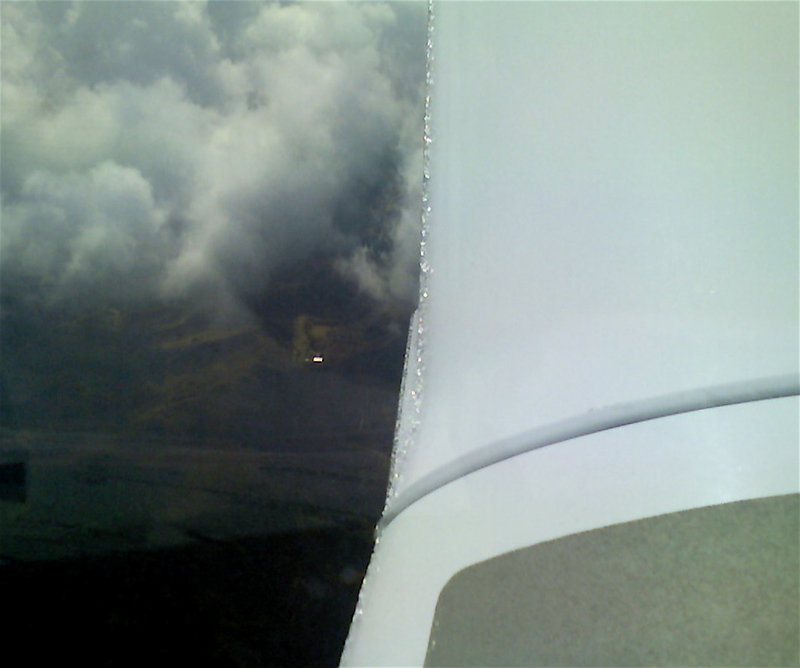 So as I climbed through seven thousand feet, and noticed that the outside air temperature (OAT) had dropped to 36f (I live in Fahrenheit, I wish I could think in metric, but I haven’t managed to switch), I turned on the pitot heat. I was under the hood, and we seemed to be flying clear of the clouds most of the time. Every now and then I saw something flit past the side window. We were climbing into clouds. I was going to get some real IMC (Instrument Meteorological Conditions) experience. We climbed and I was intent on route (a change from our initial flight plan), engine management, and telling my CFII that I never wanted to be in icing conditions. I didn’t know what people did on the east coast, how they could fly around in the clouds knowing that ice could form on their wings. We laughed about how when I first called for a lesson, an extended flight to Las Vegas and back, she had asked if the plane had de-icing equipment and whether I expected to encounter any. I said I was a little curious what ice even looked like forming on the wing and whether I would recognize it. She said, “Well, if you look out my window you can see a trace of ice, maybe just frost, on the wing.” Sure enough, there it was, just a sparkle really, on the right wing. I checked my own and I could barely discern it. It was about a thirty minute flight along this segment at nine thousand feet. We started to be in the clouds more and more. I watched and the ice built up on the wing, getting easier to see. It looked like it might be an eighth of an inch thick on the leading edge of the wing, in close by my window. I discussed it with my CFII and we decided to ask ATC for a descent. They refused the request, even thought we mentioned we had light rime ice on the wings. We could see the bottoms of the clouds on occasion and they looked to be at eight thousand feet. We checked the map and the terrain along our route of flight was a little less than five thousand feet. That meant we could easily drop out of the clouds and fly VFR in warmer air and the ice would vanish. I watched the airspeed drop five knots. After about two minutes I realized that we could climb above the clouds, too. I called and asked for eleven thousand feet and was approved. We climbed slowly. It was bouncy in the clouds and the autopilot had a hard time keeping everything going at once (on heading, wings level, climb at three hundred feet a minute). I disengaged and flew it by hand. I tried to keep the airspeed at ninety-five and occasionally we would get a sink rate of fifteen hundred feet a minute, but in general we were climbing. Slowly, edging up, but climbing. We watched the ice continue to accumulate. We discussed our exit plan, dropping out of the clouds. At ten thousand two hundred feet we cleared the top of the clouds and in another couple minutes we were at our assigned altitude. The ice sparkled brightly in the sun. We danced along the top of the clouds, huge two thousand foot thick monster clouds. The dry air and sun pulled a some of the ice from the wings until we had our original frost-like layer and some clearer stuff in close to the fuselage. About ten minutes after exiting the clouds we were cleared to descend and as we popped out of the bottom of the clouds into 46f air the ice disappeared instantly. You couldn’t even see it go, it was just there one moment and gone the next. I don’t need any more exciting lessons than that and I am glad that all of my exciting flights are with instructors. This entry was posted in Flight, Training, Trip and tagged clean. Bookmark the permalink.